We’d love your help. Let us know what’s wrong with this preview of Brother by David Chariandy. With shimmering prose and mesmerizing precision, David Chariandy takes us inside the lives of Michael and An intensely beautiful, searingly powerful, tightly constructed novel, Brother explores questions of masculinity, family, race, and identity as they are played out in a Scarborough housing complex during the sweltering heat and simmering violence of the summer of 1991. To ask other readers questions about Brother, please sign up. The well dressed man in tan suit -? Victoria I am so glad you asked this question. I didn't immediately connect the dots to the biological father, but makes sense. I had no idea what I was in for when Nicole at Bloomsbury Publishing recommended this book to me. I can’t thank her enough. I went in completely blind. Literally seconds ago I read the blurb. I read it twice. Having read the book myself, this ‘blurb’, made me cry. I know it wouldn’t have without reading the book. But given what I just ‘experienced’ those words penetrate so much deeper. Kudos to whomever wrote it...and thank you! Agree- agree- agree with the blurb: it’s “INTENSELY BEAUTIFUL....sea I had no idea what I was in for when Nicole at Bloomsbury Publishing recommended this book to me. I can’t thank her enough. Agree- agree- agree with the blurb: it’s “INTENSELY BEAUTIFUL....searingly powerful, tightly constructed”. It’s also exquisitely excruciating painful. It knocked the wind out of me. For a short novel - it packs a DEPTH-PUNCH!! Tears in a scene too! Read the Blurb - No need to repeat what’s already perfectly written. Frances Joseph is “Brother”. His character shows up as a guy to reckoned with at a very young age. I mean this in the best of ways. As first born son - he didn’t just take on the role of adult child - living with his mother and younger brother Michael - he tried to hide his contributions. He was aware of people’s pride. His mother’s in particular. I absolutely fell in love with him right away. He was loyal - but he also ran away - he loved deeply - cared deeply - but not in a sugar- coating style: the opposite. Yet ... we felt him so profoundly. The authors talent shines through his character development. He enjoyed listening to Nina Simone, Otis Redding, and Sam Cooke. face all the time. You’ve got to carry yourself better and think about your look. Doesn’t matter how poor you are. You can always turn up the edge of a collar to style a bit, little things like that. You can always do things to let the world know you’re not nobody. You never know when your break is coming”. Frances had one of those devastating experiences of just the opposite of the above quote. “We were losers and neighborhood schemers. We were the children of the help, without futures. We were, none of us, what our parents wanted us to be. We were not what any other adults wanted us to be. We were nobodies, or else, somehow, a city. We’re all just dreaming”. We were putty in the hands of younger brother, Michael as the voice for this story. I loved him as much as Frances too. We feel, sense, touch, hear, and smell everything through him. From children playing in the neighborhood, to foods, music, dialogues, strangers, murder, racial and immigrant prejudice, poverty, the police, to all out violence....and devastating loss and sadness. Michael’s storytelling is as personal as personal is. ......leaving her sister and relatives behind....people she loved...leaving slavery, indenture, murder, disease, dirt pot holes, yet love and beauty too, for a better - safer place with more opportunities. As you read the story - one wonders was the REALLY HARD HARD HARDSHIPS worth it? She never told her family the truth about her life in Canada or that her husband was out of the picture. Even the minor characters are bigger than life - in some cases with only the smallest scenes. - Aisha, Dru, Professor, Aunt Beulah, Jelly....and *Desirea’s*, the Barbershop takes on a character in its own rite. Everything about this book felt authentic to me —-although —- I did ‘question’ one scene. "It wasn't just she alone. All around us in the park were mothers who had journeyed far beyond what they knew, who took day courses and worked nights, who dreamed of raising children who might have just a little more than than they did, children who might reward scsrifice and redeem a past. And there were victories, you must know. Fears were banished by the scents from simmering pots, denigration countered by a freshly laundered tablecloth. History beaten back by the p Powerful, bold and timely. "It wasn't just she alone. All around us in the park were mothers who had journeyed far beyond what they knew, who took day courses and worked nights, who dreamed of raising children who might have just a little more than than they did, children who might reward scsrifice and redeem a past. And there were victories, you must know. Fears were banished by the scents from simmering pots, denigration countered by a freshly laundered tablecloth. History beaten back by the provision of clothes and yearly school supplies. Examples were raised." Their mother came from Trinidad, but others in Toronto, in the housing unit called the Park came from many other places. She had to work three jobs, long bus rides, to take care of Frances and Michael. They had to raise themselves, learn how to navigate where they lived, stay away from those with bad reputations which would do them harm. Yet, she showed them beauty too, tired as she was, she took them for picnics at the creek, called Rouge. Showed then the monarch butterflies and other beauties of nature. She gave them hope that if they stayed out of trouble, they had a chance. Thdy had hope, until it was taken away. I discovered this book on Kirkuses list of books that were good but had been largely passed by. I finished this book with a big Wow, stunned by this story and the devestating turn it took, though at the end hope of a kind it once again found. The beauty of the writing, because believe me this young author can write! A timely subject, immigrants, refugees trying to circumvent a system that is stacked against them. The way they are viewed as unwanted, criminals in the making, as people who are taking away jobs and resources that should be awarded only to citizens. As I said, a powerfully bold book that deserves reading. This is what I call a bittersweet story through and through. It’s beautiful, the relationship between the two brothers tremendously touching, and yet it’s also harrowing and frustrating. Why does it have to be this way? Why can’t we change the situation? What about love? What… about… love? I wish I didn’t have to pause each time I’m picking up a Canadian title to congratulate myself for picking up a Canadian title but alas I rarely seem to give attention to non-US books. And that’s a shame becaus This is what I call a bittersweet story through and through. It’s beautiful, the relationship between the two brothers tremendously touching, and yet it’s also harrowing and frustrating. Why does it have to be this way? Why can’t we change the situation? What about love? What… about… love? I wish I didn’t have to pause each time I’m picking up a Canadian title to congratulate myself for picking up a Canadian title but alas I rarely seem to give attention to non-US books. And that’s a shame because… I live in Canada. And as a Canadian resident, I am proud of this book. If it had been awful, I don’t think I would have even mentioned its Canadianness. (Yes, I know it’s not a word, Word.) But it’s not… it’s gorgeously written. The author mentions at the end of the book that it took him a long time to write it, despite the short amount of pages, and I believe him completely. It’s a short but impactful story. There are many characters, and yet it feels as though they are each given the right amount of attention. I can’t even point out which one I liked best because while the narrator is someone I would love to get to know on a personal level, there’s also Francis who I respect, Jelly I really want to hug tight, the mother I want to care for and Aisha I am dying to have a conversation with. I feel like she has so much to teach me. There are also, of course, characters I want to punch. But now I realize they’re not even worth the energy. Don’t even deserve me thinking about them. Bastards. Anyways, there is quite a lot to love about this book and if you’re the kind of reader who fidgets uncomfortably when you hear ‘‘literary fiction’’ (because what does that mean really?? ), worry not for this is a short, evenly-paced and necessary portrayal of brotherly love, racial relations, complicated grief and boundaries that sometimes need to be broken. Brother. Big brother to little brother. This could have been a quote from “Grease”, couldn’t it? But these brothers are immigrants from Trinidad, trying to fit in in Canada, specifically the Park in Scarborough, on the outskirts of Toronto. Multi-cultural doesn’t begin to describe the community here. Nobody belongs. Everybody belongs. Michael tells us his story himself, which makes it very personal and made me feel like apologising for the dreadful treatment so many migrants face. We learn right away that something happened to the older brother ten years earlier and that Mother has never really recovered. The story moves back and forth between today and childhood and youth. The boys’ father left the picture early, and Mother is sadly familiar from other migrant stories. When the boys were still young, she left them home alone with strict instructions while she went to work the night shift. They ate their food after she left and then . . . went wandering. Freedom! I know an old Croatian lady where I live in regional Australia, and she tells me proudly how when she was a young refugee widow here, she worked three different cooking jobs to raise her two little girls. She criticises today’s young people for wanting welfare because she got off her backside and managed without it. They are lazy. There are jobs there if they’re willing to work. Sound familiar? But, she left the girls home alone, at night, while she went to work, and when I told her that you’re not allowed to do that today, she basically scoffed. I have a feeling she would do the same thing today despite the law if she were in the same circumstances. I do think that’s a lot of the problem regarding welfare and equality and the common complaint of older people that anyone can get a job if they just try hard enough. Not alone with little kids, you can’t. Mostly, we’re expected to be with our children whenever they aren’t in school or some kind of care. And of course all parents aren’t equally intelligent and resourceful either. Francis was the old brother who loved music and hanging out with mates from many countries at Desirea’s, a local barber shop. This reminded me strongly of the classic Jayber Crow, where the men gathered in exactly the same way, to be part of a “family”. The more we think cultures are different, the more they are the same (a slight alteration of the French saying). Mother was told that Desirea’s is where the undesirables and law-breakers hang out and had plenty to say about it. Also sound familiar? Parents everywhere swear that if you break your neck on that bike/horse/mountain I’ll KILL you! Unfortunately, Mother was right, and they should have stayed away from Desirea’s. There was one place where they enjoyed some peace and nature, The Rouge. This is a big conservation area, and the boys and even Mother used to wander down the valley to cool off. The boys played and built things with sticks, as kids do. Michael makes a point of saying it’s not David Attenborough country, but it served them well. The story of the boys, Mother, Aisha and the other kids is hauntingly real and the author tells it well. It may not be new, but it sounds personal, sad, and angry. Thanks to NetGalley and Bloomsbury for the preview copy from which I’ve quote so much. It’s well worth reading, and if you want a first-hand opinion, read some reviews by people who have lived there themselves. P.S. To get an idea of the Rouge Valley, see this page (among others). Absolutely blew me away. From the first page I just knew I'd be utterly destroyed by the end. It just takes a while to get used to the sudden jumps in timeline. Chapters have no headings or identifiable differences from one another to mark whether the new chapter exists in the past or present, so one must read a few pages of each chapter to reorient oneself in terms of plot and storyline. ABsolutely incredible. one of my all time canadian favorites. I highly recommend it. A tightly-written novella that explores pressing topics like race, immigration, masculinity, and more within a small family living in Canada. The story revolves around two brothers, Michael and Francis, the sons of Trinidadian immigrants, of whom their father has disappeared and their mother works tireless hours so her sons can survive. The novel follows Michael and Francis as they come of age surrounded by hip hop music and potential romantic interests, as well as the anti-black prejudice that pervades their environment. Their lives change in drastic ways after the brothers experience a police crackdown and the consequences that follow. I liked this book a lot but wanted more, which may be my fault. David Chariandy writes beautifully and searingly about these brothers' development, their search for security amidst racism and toxic masculinity and uncertainty. He also writes poignantly about grief and loss, which are explored in the section of Brother that follows Michael several years after the police crackdown. Perhaps with more space to breathe and to extend, these characters could have taken up more of a permanent residence in my heart instead of only staying for a little while. David Chariandy's buzzed-about short novel Brother centres around one man reflecting on his Carribean family's life in Scarborough, and his brother's life cut short during their shared adolescence. This slim volume's prose is captivating, imaginatively descriptive, and deeply poetic. Chariandy opts for subtlety and inference rather than long passages of exposition, lending the book a sense of reality. Life, after all, rarely provides answers to some of the most tumultuous events we experience. T David Chariandy's buzzed-about short novel Brother centres around one man reflecting on his Carribean family's life in Scarborough, and his brother's life cut short during their shared adolescence. This slim volume's prose is captivating, imaginatively descriptive, and deeply poetic. Chariandy opts for subtlety and inference rather than long passages of exposition, lending the book a sense of reality. Life, after all, rarely provides answers to some of the most tumultuous events we experience. Though you might think the knowledge of Francis' death might steal the wind from the sails of this story, it actually deflates the expected drama in favour of a more complex set of conflicts. Michael and Francis' relationship often takes centre stage, but it is impossible not to be affected by their overworked, immigrant mother's often unacknowledged plight. As the brothers begin to find their own romantic footing, classical masculinity comes into conflict with reality in what I thought was a much more nuanced piece than the myriad of Op-Eds you'll find online. Really though, this book is best experienced first-hand. Chariandy's writing captivated me from the first page with its warm voice and cool sentence structure. I found myself re-reading whole paragraphs, not for a lack of understanding, but to re-experience the well-constructed sentences or see how he conveyed an old concept in a way that felt new. Though this isn't his first novel, Brother personally marks the arrival of a Canadian voice that demands attention. 4.5 stars. The reviews of some Goodreads friends had previously put BROTHER on my "radar". Canada Reads 2019 bumped this book to the top of my "to be read" list. I want to read the five finalists before the debates begin. I have one more left to read and it is on hold at the local public library. "Mesmerizing. Poetic. Achingly soulful. BROTHER is a pitch-perfect song of masculinity and tenderness, and of the ties of family and community." - Lawrence Hill, author of THE BOOK OF 4.5 stars. The reviews of some Goodreads friends had previously put BROTHER on my "radar". Canada Reads 2019 bumped this book to the top of my "to be read" list. I want to read the five finalists before the debates begin. I have one more left to read and it is on hold at the local public library. "I love this novel. Riveting, composed, charged with feeling, BROTHER surrounds us with music and aspiration, fidelity and beauty." "BROTHER diffracts the spare light toward feeling again, after tragedy. Chariandy deftly assembles that which has come apart in the life of a Black family; their privacies assaulted, their desires unmet. Such a timbrous novel. Such tender work." "A brilliant, powerful elegy from a living brother to a lost one, yet pulsing with rhythm, and beating with life." David Chariandy grew up in Toronto, Canada and lives and teaches in Vancouver. His debut novel. SOUCOUYANT, received stunning reviews and recognition from eleven literary award juries, including a Governor General's Literary Award shortlisting, a Gold Independent Publisher Award for Best Novel, and a Scotiabank Giller Prize longlisting. BROTHER is his second novel and is one of five books chosen by CANADA READS for the debates in March 2019. Coming of age in The Park, a cluster of townhouses and leaning concrete towers in the disparaged outskirts of a sprawling city, Michael and Francis, sons of Trinidadian immigrants, battle against the careless prejudices and low expectations that confront them as young men of black and brown ancestry. Propelled by the pulsing beats and styles of hip hop, Francis, the older of the two brothers, dreams of a future in music. Michael's dreams are of Aisha, the smartest girl in their high school, whose own eyes are firmly set on a life elsewhere. But the bright hopes of all three are violently, irrevocably thwarted by a tragic shooting, and the police crackdown and suffocating suspicion that follow. With devastating emotional force and searing precision, David Chariandy, a unique and exciting voice in Canadian literature, crafts a heartbreaking and timely story about the profound love that exists between brothers and the senseless loss of lives cut short with the shot of a gun. I thought that this was quite good. I loved how it focused on not only a family, but a community too. The area where this is set is inhabited by a lot of immigrants from different places and their children. They come from all parts of the world but they all make up one community now. What I loved was that sense of lots of different cultures being integrated into the community. I'm from a rural Irish town so everyone I know here is Irish and there aren't other cultures celebrated 3.5ish/4 stars. I thought that this was quite good. I loved how it focused on not only a family, but a community too. The area where this is set is inhabited by a lot of immigrants from different places and their children. They come from all parts of the world but they all make up one community now. What I loved was that sense of lots of different cultures being integrated into the community. I'm from a rural Irish town so everyone I know here is Irish and there aren't other cultures celebrated around here. I think that's why I loved that aspect so much. A bit I found really beautiful was quite a simple thing; when the family are grieving, dishes are left at their front door for them and Michael mentions how some of the dishes are unfamiliar to him. I just thought that that really reiterated how there were all these different cultures at work in this one community. I also loved that sense of community Chariandy created. It highlighted that it doesn't matter where you're from or what race you are, we are all human, we are all the same and we all deserve to be treated accordingly. I liked the family dynamic that was at play. I thought that it was so authentic, the family and each individual character seemed so real to me. I also really liked the writing and the tone of the book. It was very refreshing and it was felt quite unique. The only problems I had was that it didn't completely reel me in and I just don't think it's will end up being very memorable for me. I would recommend this & I would read more by David Chariandy. This novella deals with a young black man living in a Toronto community and trying to move past the death of his elder brother. It’s told in first personal narrative and often in the form of flashbacks to when they were growing up. His mother has never quite recovered from the death of her son. Both are dealing with their own individual grief. The book is very timely, especially when it delves into the plight of black teenagers, stopped and questioned, just for being. Someone’s always calling and complaining to the cops. I found it interesting to see this is not just an American issue. It’s a very depressing book. Francis was everything to Michael and when he was lost, so was Michael and so was his mother. The book makes some important points. This book grew on me. I appreciated it more after I was done than while I was reading it. It was so dark, it was hard to read. Brother is an emotional read, not least because, from the outset, the reader has a sense of inevitability that promising lives will be unfulfilled or end tragically. Danger seems always close at hand in the area where the family live. ‘Always, there were stories on TV and in the papers of gangs, killings in bad neighbourhoods, predators roaming close.’ The relationship between the two brothers is beautifully rendered, with Francis acting as protector and guide to his younger brother. There is al Brother is an emotional read, not least because, from the outset, the reader has a sense of inevitability that promising lives will be unfulfilled or end tragically. Danger seems always close at hand in the area where the family live. ‘Always, there were stories on TV and in the papers of gangs, killings in bad neighbourhoods, predators roaming close.’ The relationship between the two brothers is beautifully rendered, with Francis acting as protector and guide to his younger brother. There is also a strong sense of the bonds of loyalty to your family, your friends - your 'group', as it were. Ultimately the latter will lead to tragedy. Brother – sadly - tells a story that is probably being played out in many of our communities right now. It’s a relatively short book but one that packs an emotional punch. There is always a story connected to Mother and me, a story made all the more frightening through each inventive retelling among neighbours. It is a story, effectively vague, of a young man deeply “troubled”, and of a younger brother carrying “history”, and of a mother showing now the creep of “madness”. Here's my awful confession: Whenever I hear that there's been some gang-related shooting in Scarborough, it doesn't feel like a full-blown tragedy to me; you run with gangs, you run those risks (naturally, I do empathise with the families who lose their sons; with the neighbourhoods terrorised by drive-by shootings; the unintended victims). And note: Just because the Scarborough gangs tend to be made up of young men of colour, my reaction isn't race-related; I am also emotionally unaffected by white bikers or mafiosi gunning each other down, blowing each other up; this is a them thing that feels unrelated to me. So what author David Chariandy does in Brother feels important and overdue – by giving voice to these young men of colour and exposing the reality of what a newspaper might label their “gang”, I was given that one person to identify with that removes the barrier between “them” and “me”; I felt and personalised the tragedy. This is what good books do. Brother opens ten years after an unnamed event in which the main character, Michael's, older brother Francis has apparently died. Raised by a single mother – a Trinidadian emigrant who is now confounded by “complicated grief” – Michael still lives in that same apartment in the same run-down housing complex in Scarborough, now taking care of the mother who did her best to care for her two sons. Although Michael has tried to shield his mother from the sadness of being reminded of Francis over the years, when people from their past begin showing up in the present, it's unclear which one of them is too fragile to confront the memories. In each chapter, the narrative shifts between the present, the childhood of the brothers, and the events that led directly to Francis' death in 1991; each stream adding vital information to the whole picture. Had I recognized it only then? We were losers and neighbourhood schemers. We were the children of the help, without futures. We were, none of us, what our parents wanted us to be. We were not what any other adults wanted us to be. We were nobodies, or else, somehow, a city. For a rather short book, Chariandy includes just enough scenes in each time stream to show who these brothers are: Their mother locking them in the apartment as young children so she could go to cleaning jobs, hoping for double shifts and overtime just to fill the fridge; the boys sneaking out to explore the Rouge Valley (a garbage-strewn rift of green that runs through the neighbourhood); their mother stressing education (despite teachers recommending that the bright brothers be lowered from the academic level to the basic; apparently this happened to Chariandy – now a PhD and professor at Simon Fraser – at a school in the same neighbourhood). These are good boys, even if shopkeepers watch them warily; even if they must stand by raging impotently as strangers hurl racial slurs at their mother; even if the nightly news has conditioned them to be scared of “black criminals”. When, in the stream leading up to Francis' death, they witness the murder of Anton – a neighbourhood acquaintance and the kind of low-level criminal that I generally find it hard to empathise with – the brothers are cuffed and roughed up by the police in a “round up everyone and sort it out later” operation. Francis is angered by this emasculation and starts spending more time with his “gang”: a group of boys who are experimenting with vinyl and turntables, exploring the musical possibilities at the dawn of hip hop. These are good boys, but in the atmosphere following Anton's death, compounded by further injustice, Francis starts to push back. Mother stayed quiet. She did not say that our father had left us years before. She did not admit that she had not had the time or money to complete her studies to become a nurse. She did not hint at the debt or struggles or the aches she often felt. As we headed to the airport, she just nodded and looked out the window at the coconut trees towering black against the evening sky, and the old untended fields of cane stretching out like a sea. And after the racism – subtle and overt – that she experiences in Canada, the abandonment, lack of real opportunity and social mobility, and most tragically, the loss of her eldest son, I have to wonder if this stoic character thinks the move away from her large, loving family and community had been worth it. There's just so much to think about with this book. 3.5 stars. Some lovely writing about grief-stricken Michael and his Mother years after the loss of Francis, the Brother of the title. We get a sense of the summer heat, the low expectations directed at the brothers by their school and shopkeepers, the exhaustion and frustrated hopes of Mother and other parents of colour in the Park for their children as Michael remembers the shooting of a neighbourhood boy one summer evening years before the story opens in the present. This incident spurs Franci 3.5 stars. Some lovely writing about grief-stricken Michael and his Mother years after the loss of Francis, the Brother of the title. We get a sense of the summer heat, the low expectations directed at the brothers by their school and shopkeepers, the exhaustion and frustrated hopes of Mother and other parents of colour in the Park for their children as Michael remembers the shooting of a neighbourhood boy one summer evening years before the story opens in the present. This incident spurs Francis to leave home. Michael, meanwhile begins a relationship with local girl Aisha, who's intent on a future far from the Park. Years later, we see Michael and Mother, practically frozen in their grief, stuck, in the present. A sad novel that is beautifully written. An elegy for a brother lost, and a tribute to those who migrate from far away to lands that supposedly house better opportunities and greener pastures. Posturing is the theme that will always come to mind when thinking of Brother. Is Masculinity itself one big posture? Is it necessary? Are men the only ones posturing or are we all doing it? Plenty of questions to answer and more thoughts to come. A short novel without a wasted word that packs a powerful punch, exploring issues of immigration, poverty, masculinity. family and racism, set in a Scarborough housing complex. A novel set in the same location, exploring the same themes, that I read earlier this year read like it was written by someone that took a creative writing class (albeit, still a worthy debut). In comparison, Chariandy writes like someone that could be teaching master classes. A great addition to Canadian urban grit-lit. Canadian author David Chariandy’s second novel was longlisted for the Giller Prize and won the Rogers Writers’ Trust Fiction Prize. Narrator Michael and his older brother Francis grew up in the early 1980s in The Park, a slightly dodgy community outside Toronto. Their single mother, Ruth, is a Trinidadian immigrant who worked long shifts as a cleaner to support the family after their father left early on. From the first pages we know that Francis is an absence, but don’t find out why until nearl Canadian author David Chariandy’s second novel was longlisted for the Giller Prize and won the Rogers Writers’ Trust Fiction Prize. Narrator Michael and his older brother Francis grew up in the early 1980s in The Park, a slightly dodgy community outside Toronto. Their single mother, Ruth, is a Trinidadian immigrant who worked long shifts as a cleaner to support the family after their father left early on. From the first pages we know that Francis is an absence, but don’t find out why until nearly the end of the book. The short novel is split between the present, as Michael and Ruth try to proceed with normal life, and vignettes from the past, culminating in the incident that took Francis from them 10 years ago. It's difficult to capture the slow-burning sense of alienation that someone can feel within family life, but in “Brother” David Chariandy powerfully depicts the story of a working class mother and her two sons in a way that gives a fully rounded sense of this. Michael lives with his grieving and fragile mother in a tower block in Scarborough, a district of Toronto with a high immigrant population. He still sleeps in the bunk bed of his childhood, but now the top bunk is empty and gradually we di It's difficult to capture the slow-burning sense of alienation that someone can feel within family life, but in “Brother” David Chariandy powerfully depicts the story of a working class mother and her two sons in a way that gives a fully rounded sense of this. Michael lives with his grieving and fragile mother in a tower block in Scarborough, a district of Toronto with a high immigrant population. He still sleeps in the bunk bed of his childhood, but now the top bunk is empty and gradually we discover what happened to his absent brother Francis over the course of the novel. Michael struggles to get enough shift work at his low-paid job and spends the bulk of his time caring for his mentally-precarious mother. They are both haunted by a sense of loss and penned in by their circumstances. What's so beautiful about Chariandy's narrative is how he subtly captures the sense of a family who essentially loves and cares for each other, but whose status as West Indian immigrants has made them into perpetual outsiders and these internalized feelings make them unknown even to each other. This is the story of a life, lives, that differ immensely from my own. And while, of course, I'll never know what that life is like to live, I believe that this book is as good as any I've ready to help me taste it just a little bit. The book has left me a bit speechless. Such talent in writing, and such a story. I can't stop thinking about it, and I doubt I will anytime soon. This is a book that completely engulfed me, ate me whole. I loved it. A story of a lost brother and the subsequent 'complicated grief' within a poor immigrant community. This was a short but tragic and powerful novel which I could not put down - such beautiful writing. A young man goes to meet an old friend who is returning to visit the neighbourhood where she grew up and he still lives. Aisha's visit prompts Michael to think back to his childhood and teen years in the 1980s, when he and his older brother Francis were being brought up by their mother, an immigrant to Canada from Trinidad whose husband had deserted her when the boys were young. She is strict with the boys, with the usual immigrant dream that they will make successful lives in this society that is new to her. But she has to struggle hard to make ends meet, working several jobs, often having to leave the boys alone and usually exhausted when she finally gets home. So the boys, good at heart, have too many opportunities to drift into the 'wrong' crowd. When they are caught up in an incident of street violence, it begins a chain of events that will ultimately lead to tragedy. This is a short book with no unnecessary padding, and its brevity makes it all the more powerful. It's a story of how the immigrant dream can go wrong, but it's not overtly hammering polemics at the reader nor too heavily making a 'point'. I found it eye-opening, though, because I'd never really thought of Canada as having the kind of immigrant neighbourhoods described so vividly in the book. Chariandy brings the neighbourhood of Scarborough to life, showing it as a place where a constant influx of immigrants from different countries around the world first settle when they arrive in Canada, seeing their life there as a stage on the road to either them or their children one day making it in their new world and moving on to more desirable areas. The city of which the neighbourhood is a suburb is, I think, Toronto, but really it could be any big city, in almost any Western country. There is poverty here, both financial and of expectations, and there's the violence and insecurity that usually goes with that; and the exploitation of these incomers as a ready supply of cheap and disposable labour by unscrupulous employers. But Chariandy also shows the kindness that can exist among people when they all face the same problems and share the same dreams. I found the portrait of the neighbourhood utterly believable, drawn without the exaggerated over-dramatisation that often infests books about the failure of the immigrant dream, making them feel like an unnuanced and often unfair condemnation of the host nation. Although this book centres on a tragedy, Chariandy also allows the reader to see hope – to believe that for some, the dream is indeed possible to attain; and this has a double effect – it stops the book from presenting a picture of unrelenting despair, and it makes the events even more tragic because they don't feel as if they were inevitable. There's also a short section of the boys and their mother visiting Trinidad – her home, but a new country to them, full of relatives they've never met and a lifestyle that is as foreign to them as Canada is to their mother. Again beautifully done, Chariandy shows the freshness of the immigrant dream through the eyes of the Trinidadian relatives, who assume that the mother's life in Canada is one of comfort and ease in comparison to their own, while the reader has seen the reality of constant days of struggle, hard, poorly-paid work and exhaustion. Francis and I lay down on our mat, but when the lights were turned off, we couldn't sleep. Wild creatures called in the dark, and the air was filled with the hum of insects, louder than any traffic we heard at home. The living room window framed a full moon that shone like a cool white sun, and billions of stars, a universe we had never even imagined. 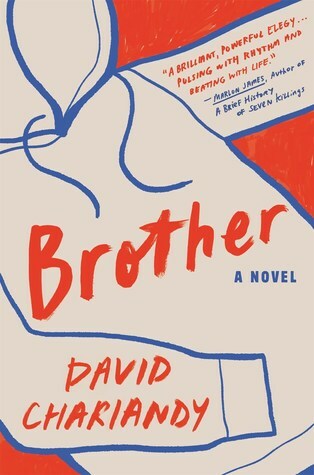 David Chariandy’s novel Brother is an absolutely tremendous, albeit heartbreaking read. Alternating between the past and the present, Chariandy’s book tells the story of two brothers and their single mother living in The Park – a Scarborough housing community outside Toronto. I wouldn’t be so bold as to say that I know the depths of the challenges the two brothers faced on their journey, but there were a few similarities that had me identifying with their situation. Like Michael and Francis, my brother and I grew up in community housing with a single parent. I’m probably about the same age as the narrator, or at least I believe I am, and we didn’t have a lot of money to go around. Fortunately for my brother and I – and unfortunately for the duo in the novel – that’s about where it ends with regards to commonality. Chariandy’s writing here is beyond impressive. Despite the tragic nature and overall tone of the novel, it was one of the most enjoyable reads I’ve had in quite some time. There was such an effortless flow to his prose that it put me right inside that housing complex with the two brothers and their group of friends, way back in the sweltering summer of 1991. This is a story that could easily lend itself to another one to two hundred pages, but Chariandy keeps it lean and mean while making sure to pack a punishing emotional punch. As a reviewer, I try to be open and honest about my potential biases. One of those is my inherent distrust of the novella. I have read some excellent novellas, but I find most of them wanting; somehow they usually feel overlong and too short. Brother, out today, feels a little like that. Coming in at a relatively scant 190 pages, this is a literary tale of immigration and racism and police brutality and the wealth gap, all vital and important topics in today’s society. And though this story takes As a reviewer, I try to be open and honest about my potential biases. One of those is my inherent distrust of the novella. I have read some excellent novellas, but I find most of them wanting; somehow they usually feel overlong and too short. Brother, out today, feels a little like that. Coming in at a relatively scant 190 pages, this is a literary tale of immigration and racism and police brutality and the wealth gap, all vital and important topics in today’s society. And though this story takes place on the backstreets and in the ghettos of Canada, the lessons are applicable to the current political and social climate found in the U.S. But the subject matter is never enough, not for me; what about the prose? Characters? Plotting? I am happy to report this author’s prose is some of the most searing and poetic I’ve read in weeks, months. And the characters are well done too, though I would have appreciated spending more time with the peripheral folks. They felt almost totally bland, lifeless. This short novel’s “gimmick” is switching between two time periods. In under 200 pages, this author tries telling two equally gripping and complex tales, never letting either one fully breathe. And the reader is never told when they have gone back or forth in time; the author just throws flashbacks in, seemingly, at random. Not a fan of that — it doesn’t make this story seem deep, it makes it seem chaotic. Terrorized, shell-shocked, just like the brothers’ single mother from Trinidad who walked barefoot to the river’s edge and stared for hours, hopeless, I closed the book. Chariandy paints a solemn picture of life in a ramshackle housing complex in Canada invaded by poverty and shootings. Named the Park, it is itself a pariah, as are those who inhabit it. Francis is Michael’s, the narrator’s, older brother. When the two of them witness their friend’s shooting death in the Park, Francis is never th Terrorized, shell-shocked, just like the brothers’ single mother from Trinidad who walked barefoot to the river’s edge and stared for hours, hopeless, I closed the book. Chariandy paints a solemn picture of life in a ramshackle housing complex in Canada invaded by poverty and shootings. Named the Park, it is itself a pariah, as are those who inhabit it. Francis is Michael’s, the narrator’s, older brother. When the two of them witness their friend’s shooting death in the Park, Francis is never the same. At 14-years-old, his eyes become those of a zombie. He drops out of school. He moves out. He spends his time at a barber shop with his friends who appear to make money illegally. He drops groceries off for his mother and Michael, but remains a disappointment to his mother. We meet other residents of the Park. There’s Jelly with whom Francis makes rap music. And Aisha, Michael’s first love, back because her father recently died. Everyone is just trying to get by. But the Park is soul crushing. Chariandy’s beautiful writing captures the utter despair that befalls the residents of the Park. Michael and Francis are the victims not only of poverty and discrimination, but systemic injustice, the kind that makes your eyes water and makes you want to help someone. I look forward to reading more of this Canadian author’s work. It’s kind of a cliché for me to say this, but this slim novel packs a heavy emotional punch. The prose is sparse but beautiful and almost dreamlike at times, and seems quite fitting to the subject matter - how the family deal with the aftermath of a devastating incident and the impact it has on them. I would point anyone interested in this in the direction of ns510's excellent review, as I don't know quite how to convey my feelings on this myself. this book is heartbreakingly good, evocative, timely. necessary! the novel has been longlisted for canada's $100,000 giller prize, and it is now my frontrunner. chariandy is a beautiful writer. This is the second book of this year's Canada Reads shortlist that I've read so far, and with just over a week left before the debates begin, I'm hoping I'll still be able to manage fitting in the other three books. Brother is an apt name for this small novel because it is about a younger brother, about his older brother. On its own it stands firmly, but because it's set in Scarborough I felt like it moved me especially. I only lived there until I was seven years old but I know the place intimate This is the second book of this year's Canada Reads shortlist that I've read so far, and with just over a week left before the debates begin, I'm hoping I'll still be able to manage fitting in the other three books. Brother is an apt name for this small novel because it is about a younger brother, about his older brother. On its own it stands firmly, but because it's set in Scarborough I felt like it moved me especially. I only lived there until I was seven years old but I know the place intimately - its unique dynamics, the truths and untruths of its reputation - as only one can know a place like Scarborough if you live there for any period of time. It's easy to lose someone, and it's easy to have very distinct experiences and memories growing up as a person of colour or an immigrant (or both) in Scarborough, as the main character of Brother, Michael, does. More fulsome review pending: This heartbreaking story set in the gritty Jane and Finch projects tells the story of a family, a mom fighting to support and raise her two boys alone, an older brother trying to find himself and support those that he loves and a younger brother looking up to him and growing up in the face of so many challenges. This truly was a book that opened my eyes and would have been a great book to debate at Canada Reads.